On a Maine summer day in 1884, twelve-year old Penobscot Indian Louis Sockalexis first fell in love with baseball. As he grew up, Louis honed his skills and dreamed of one day joining a major league team. Louis encourtered opposition at every turn—from the jeers of teammates and taunts of spectators who thought he had no place in a "white man's sport" to the disapproval of his father, who wanted Louis to focus on tribal life. Louis finally made it to the major league Cleveland Spiders, but racism followed him, until one momentous day in June 1897 at New York's Polo Grounds. Facing off against the most feared pitcher in baseball, Louis proved he belonged in the sport—to the crowd, to the other placers, to his father, and most of all, to himself. With determination, courage and quiet dignity, Louis Sockalexis, the first Native American to play major league baseball smashed racial barriers and home runs, leaving an indelible mark on America's favorite sport. Are you an avid baseball fan? If so, what about baseball captivates you? BW: I have been an avid baseball fan since I was ten years old. During baseball season I follow major league baseball daily, keeping close track of team accomplishments and player statistics, as well as trades, records, and standings. I’ve read hundreds of baseball books—both fiction and nonfiction—and have seen every baseball movie ever made. I’ve always been captivated by the rich history—the legendary players, the memorable stories, the benchmark records of the sport. I guess you could say I consider myself a “baseball historian”. BF: I’m an avid fan around the play-offs. What captivates me about baseball is the history behind the game. Every American kid can remember playing in a backyard or vacant lot, but to him it was Yankee stadium or Fenway Park. Which is your favorite baseball team? BW: My favorite team is the Boston Red Sox. When I was a young boy, my father would tell me stories of riding the train to magical Fenway Park in Boston to see Red Sox heroes such as Ted Williams, Jimmy Foxx, and Dom DiMaggio. When I was just eight years old, my father took me to Fenway for the first time to see the Red Sox play the New York Yankees, and I too became forever hooked on the Sox. BF: I grew up in Connecticut, so most of us were Yankees fans. How did you first learn of Louis Sockalexis? BW: I first learned of Louis Sockalexis when I was thirteen or fourteen years old. I was researching a report for junior high school English class on big league baseball players from the state of Maine, and I came across Sockalexis and his story. I discovered that Sockalexis was not only one of Maine’s greatest athletes ever, but also one of America’s most talented baseball players of the time. BF: I hadn’t heard of Louis Sockalexis before I signed on to do the illustrations for the book. But that’s one of the great things about illustrating picture books—you get the opportunity to research and learn about a little slice of history. What kind of research did you conduct for this project? BW: For this book, I read a couple of in-depth biographies on Sockalexis and every magazine article I could find. I also spent time online, where I found some old newspaper articles that were helpful. Throughout my research, I was surprised to find out just how well-known Sockalexis was during his day. Even in college—prior to becoming a professional baseball player—he was a true sports celebrity. An interesting tidbit that many historians maintain is that popular author Burt L. Standish modeled his fictitious sports star Frank Merriwell after Sockalexis. The Frank Merriwell character, an all-American sports hero, first appeared in books, magazines, and comics in the late 1890s, then showed up years later on the radio. BF: I looked through my own picture files and library for baseball references. Then I hit my local library and took out every baseball coffee table book I could find and then searched the Internet for everything I’d missed. During this process I set certain photographs off to the side that I thought might work for the book. Most of what I was looking for were poses that got the form right. A lot of the old photos have a certain light and the people’s gestures suggest that time period. Once the research was completed I started generating the illustrations. To do this, I read through the manuscript and made a list of fifteen to sixteen illustrations that would tell the story of Louis Sockalexis. After the list is approved by the editors I start painting little studies in oil on canvas. I can usually work out a lot of potential problems at this stage. One of the biggest challenges for this book was trying to make Louis look like Louis from boyhood to adulthood. This was not easy because there are very few photos of Louis Sockalexis. Have you had a chance to share the book with children yet? BW: I’m a middle school teacher, and I’ve read the book to some of my classes. The students liked my story very much. Many commented on how courageous Louis was. Others spoke about the idea of having a dream and pursuing it. On another note, they were very impressed with illustrator Bill Farnsworth’s superb artwork. BF: I have a visit coming up at the school where my wife teaches, and I am sure the students will like the book very much! BW: I hope readers come to realize that Sockalexis was both an extraordinary athlete and a truly extraordinary person. His story deserves to be known. Louis Sockalexis was truly an American hero. 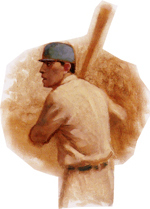 BF: While the book is the story of a baseball player named Louis Sockalexis, I hope the reader sees that the book is also about tolerance and fulfilling dreams.